This is not the case for Interior Communication Electrician 2nd Class Ivane Mendoza, from Navy Recruiting Station National City. A native of National City, Mendoza feels honored to be recruiting in her hometown. “I love that I was given the opportunity to return and give back to the community that impacted who I am today,” Mendoza said. After eight years in the Navy, and a tour aboard U.S.S. John C. Stennis, Mendoza chose orders to NRD San Diego. After two years recruiting, Mendoza feels that there are both rewards and challenges. Mendoza said that the greatest challenge she has faced is the negative perception many people have of recruiters. “It is difficult to gain the trust of our applicants when the many people perceive recruiters as dishonest and deceitful,” Mendoza said. Mendoza’s performance on recruiting duty has not gone unnoticed. At the command’s district training meeting, Mendoza was recognized as NRD San Diego Junior Sailor of the Year and New Accession Training (NAT) Recruiter of the Year. NRD San Diego Commanding Officer, CDR Patrick Copeland, considers Mendoza to be one of his top performers. Mendoza shared advice she would give to someone thinking about recruiting duty. 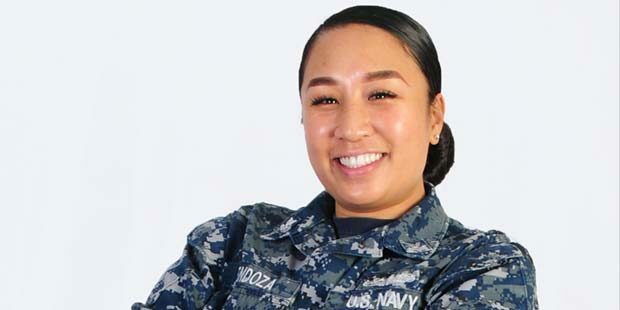 Mendoza, who recently reenlisted for six years, said that she looks forward to going back to sea duty. “At the end of my sea tour, I’m very interested in coming back for another recruiting tour,” she added. Established January 1975, NRD San Diego encompasses 210,000 square miles covering Arizona, Nevada and Southern California. Headquartered at Naval Base Point Loma, NRD San Diego has more than 50 recruiting stations in the region and employs more than 300 recruiters, support personnel and civilians. The Navy’s recruiting force totals more than 6,100 personnel in more than 1,300 recruiting stations around the globe. Their combined goal is to attract the highest quality candidates to assure the ongoing success of America’s Navy. NRC consists of a command headquarters, two Navy Recruiting Regions, 20 Navy Recruiting Districts and six Navy Talent Acquisition Groups that serve more than 1,300 recruiting stations across the country.